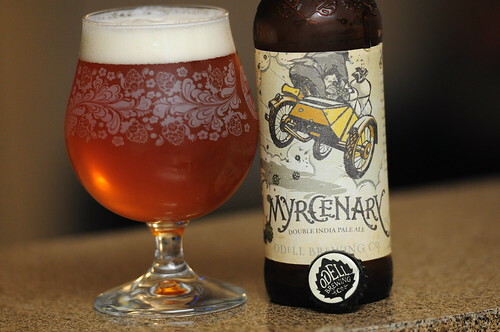 Odell Myrcenary DIPA, originally uploaded by adambarhan. A: Pours a golden color with a finger or two of white head. T: A really nice fruitiness to the flavor. Plenty of citrus, particularly grapefruit and tangerine. Mild grass notes and a decent amount of pine, a moderate bitterness to go with it. Some decent bread flavors round out the beer. M: Medium in body with a medium to high carbonation. O: Pretty solid IPA. Nice hoppiness and not really sweet at all.